Junket - What Does It Mean? 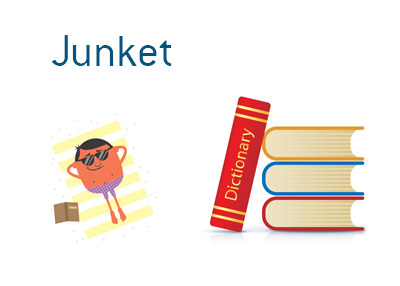 What does the term "junket" mean? What is the definition of the term "junket"? In the world of politics, a "junket" is a seemingly unnecessary trip that is taken by a politician that is paid for with public funds. A "junket" usually features extravagant spending that is deemed as being unnecessary by a percentage of the voting public. For instance - let's say that a sitting President travels to New York to speak at the United Nations. There is obviously nothing wrong with that, but let's say that the President decides to stay for four days and see a show with his wife and hit numerous restaurants for expensive dinners. In order to accommodate the President, the hotel must block off a couple of entire floors. In addition, there are costs for the airplane, Secret Service and more. While the trip to the United Nations may have been necessary, some voters will furrow their brows at the amount of money that was spent on the trip, as the President could have flown in and out on the same day.